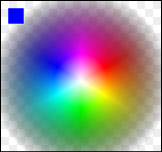 The standard chart (a great resource provided by Mozilla) describing the effects of the globalCompositeOperation is incomplete, as it leaves us to extrapolate how 99% of the color-spectrum, and multiple levels of opacity, will affect the composite operation. The following chart allows you to see what the globalCompositeOperation’s is doing on a pixel-to-pixel basis. Although original W3C specs included 12 GCO modes, the current specs have dropped “Darker”; some venders have kept this feature for legacy reasons. The problem was no one could agree on a standard formula. Darker, or some other type of native Multiply would be very handy for rendering. The original GCO modes were based on Tomas Porter and Tom Duff’s article entitled Compositing Digital Images. There is missing support for GCO modes between browsers that needs to be sorted out. Currently, six-modes work without fail across browsers (IE9, Chrome, Safari, Firefox, and Opera): source-over, source-atop,-over, destination-out, lighter, and xor. For a more detailed report on which browsers support what check out Mike Rekim’s report. I was recently asked to create artwork for the C.A.R.D.S. Project. Chris & John gave me no restrictions, and only one task: Create something interesting that fits on a 3.5 x 2.0 business card. For me, this was a dream project and an exciting excuse to play around with some generative algorithms! My goal was to create an ‘ocean scene’. To do this I used Perlin noise vector fields, bezier curves, and color cycling. The ‘creatures’ or ‘waves’ are grown based on randomized parameters such as ‘width’, ‘length’ and ‘color’. The parameters change over time; some linearly, while others are mapped to cosine/sine waves and easing functions (this resulted in a more organic feeling). I ended up submitting 250 unique cards to the project. Each card is composed of 10-frames and took 1-2 minutes to generate. Many were thrown out in the process! From there the cards were sent to GifPop for lenticular printing. I recently had the pleasure of working on Google’s Made with Code initiative with the Red & Co. creative studio and Mash a group of developers located in Portland Oregon. From there, the bracelets are sent to Shapeways where they are printed with high-quality nylon plastic on 3D printers from EOS, a German printer manufacturer who provided P760 SLS 3D printers to support the initiative. The Bracelet challenge has a limited print run, so get them while you can! After that there will still be a lot of other fun challenges on the Made with Code website. © GALACTIC MILK 2015. ALL RIGHTS RESERVED.